In a world full of unnecessary Stuff, National Parks have long been a testament to Americans’ commitment to protecting unique natural places. From Yosemite to the Everglades, the Rocky Mountains to the Grand Canyon, these places are icons of our country’s beauty and our shared desire to preserve wild spaces. But our National Parks are being threatened by plastic pollution from bottled water. Working with our friends at Corporate Accountability International, the Story of Stuff Community supported National Parks, like the Grand Canyon, to go bottled water free. But a recently introduced congressional amendment is trying to take away these protections and prevent parks from opting out of selling bottled water. The culprit? A wealthy Congressman, Keith Rothfus (R - Pennsylvania), who stands to personally profit from continuing to peddle bottled water in our parks. Coca-Cola is one of the world’s largest perpetrators of single-use plastic water bottles. A few years ago when the National Park Service Director, Jon Jarvis, researched the impact of selling Coke brand Dasani water at the Grand Canyon National Park, he made a startling discovery - plastic bottles accounted for most waste generated by the park AND resulted in most of the litter. The National Park Service Director took a courageous stand for sustainability by banning the selling of single-use bottled water in the Grand Canyon. Since then, over a dozen additional National Parks followed suit. Today, bottled water vending machines across these parks have been replaced with water filtration stations and signs to educate visitors about the importance of reusable bottles. The result is more pristine parks that contribute less to our worldwide problems with waste. 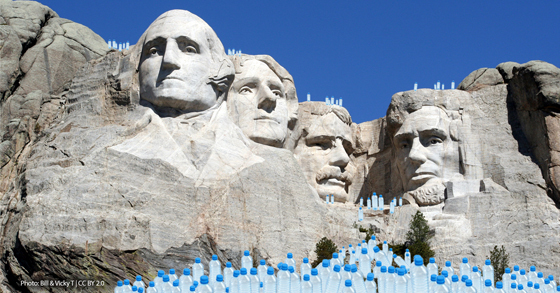 The National Park ban on single-use bottled water is a classic case of people coming together and flexing their citizen muscles to preserve a valuable and shared resource, but Congressman Rothfus is trying to stop success in its tracks. By trying to eliminate federal funding for park superintendents’ who want to ban bottled water, Rothfus is trying to take power away from the parks, and the people. Why would Rothfus do this? As it turns out, he owns between $500,000 and $1,000,000 in Coca-Cola stock - so if his amendment passes into bill form it will benefit Coca-Cola’s bottom line AND his own, but subject our National Parks to a continued onslaught of plastic pollution. It’s just plain shameful! Coca-Cola’s lobbyists may have immense resources, but we think our commitment to protecting our National Parks is stronger. In our Story, the National Parks are a shared resource to be preserved and enjoyed by all, not a profit-maker for Coca-Cola and its shareholders.